Price : $50 per Person (depend on how many people in your group, transportation : Private Car, Motorbike…). 1 – Linh Quang Buddhist Temple with huge and long concreted dragon). 2 – Agriculture farm with especially the terraces vegetable. 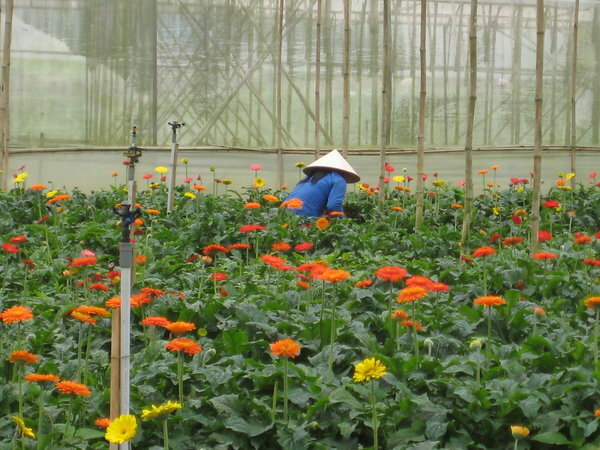 3 – Flower farm – Van Thanh flower village. Distance to go : almost 120km.The tour will be starting at the hotels you staying in Da Lat. We will come to pick you up. Arriving : around 4:00 pm. It depends on how long you take time when we stop. Price included : Entrance Fees, Private Car, Private Guide, Purified Drinking Water. Excluded : Foods and personal expense, ticket for the Crazy house, roller coaster, elephant riding and ostrich riding. • At all places we stop, i will tell you, as well as explain to you different stories,topics depending on where we are so its very informative. You can of course take photos even wherever on the tour you like. • For the tour, you can also contact locals to see how they live and the way they make their living. • Its also very randomly that we suddenly stop on the road when seeing something that would be interesting for you to see.